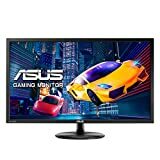 Looking for the best budget 4k monitor to upgrade your current computer or add to a new build? 4k monitors have recently come down in price, and that great 4k look is not out of reach anymore for those that are more budget-conscious. You don’t have to break the bank anymore to boost your resolution. If you can afford it, making the jump to 4k is totally worth it. The improved resolution not only improves clarity and gives you a better experience, but it can also improve productivity as well. Given that many graphics cards now support full 4k gaming at 60+ FPS, it’s a no-brainer. Screen size usually has the biggest impact on price for monitors. Think about what you can afford; however you’ll never be upset if you choose the biggest monitor you can get (unless you have strict space requirements). Display type is another price impactor. There are four basic panel types: TN, IPS, PLS and VA. If you’re a gamer then a TN panel is for you; with the lowest latency this is a must for fast paced games. The only downside to TN is that the color reproduction can be a little bit lacking, especially when viewing the screen at extreme angles. However, a higher quality TN screen will reduce this impact. IPS and PLS screens are much better for accurate color reproduction, which is ideal for graphic designers, photographers, and video editors. However these displays will have a higher latency which is not the best for competitive gamers. They also tend to be more expensive. VA displays are rare, but have high latency with good color and contrast. Gaming monitor enhancements that match your graphics card are also important to take into consideration. Nvidia hardware uses G-Sync and AMD hardware uses FreeSync. Check what your computer or gaming console uses before getting your monitor. These technologies can reduce screen stutter and tearing and can improve your gaming experience even more than increasing your resolution or refresh rate. This monitor for ASUS wins in terms of overall bang for your buck. The low price combined with crisp visuals enable you to boost your system without having to spend a lot of money. This monitor was geared more towards gamers looking to upgrade their resolution and response time. This wouldn’t be the top choice for those looking for a monitor to accurately edit colors in photography or video, however. See our picks below for those choices. 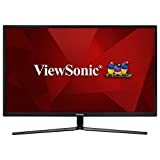 For productivity and graphics tasks, the huge 32″ ViewSonic VX3211 is an excellent upgrade for a budget price. This monitor boasts an MVA panel that allows excellent color and contrast from wide viewing angles, a thin bezel, AMD FreeSync technology, and 86% NTSC color coverage. This would be an excellent choice for video editors, coders, web designers, and those looking for a nice gaming experience that don’t need ultra fast latency. This Samsung UHD (ultra high-definition) monitor boasts over a billion colors and a 1ms response time for amazing clarity and smoothness. With AMD FreeSync this TN panel monitor is an excellent choice for both productivity and gaming, although high end photo and video editors might need a more accurate color display. The included EyeSaver mode reduces eye strain by reducing blue light emission as well as flickering.